Valentine's Day is right around the corner and you may be searching for the perfect Valentine's Day gift for her. Maybe you’re searching for a gift for the love of your life, a girlfriend, a friend, your mother or grandmother, or your daughter. It usually isn’t difficult to shop for women since they are often willing to tell you the things they like. Just remember, the one thing most women have in common is the love for sweet things and chocolate. A great Valentine's Day gift for her is often something that is sweet and will most assuredly put a smile on her face. There is a dichotomy that takes place all the time for both men and women of wanting to be healthy, look good and stay away from sweet treats vs. intensely craving and wanting sweet treats, especially around the holidays. The key to satisfying both of these desires and cravings is to find some balance somewhere in the middle. One option is to combine the sweets with foods that will help offset the sugar with healthy fats and protein. Adding healthy fats and protein helps level out the speed in which our body metabolizes sugar. Healthy fats and protein also assist in being satiated sooner rather than later. 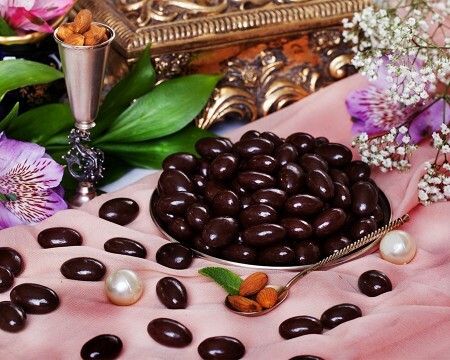 One example is to combine chocolate with nuts like chocolate covered nuts. In this bag you can include a variety of Eatnuts.com Chocolate Covered Nuts, Eatnuts.com Pretzels, and Eatnuts.com Dried Fruits. You can create combinations or throw a bunch of various bags into a basket and create a Valentine day gift basket as a part of your Valentine’s Day gift sets for her. You can make beautiful gifts by using Mason jars and filling them with different Eatnuts.com Trail Mixes, Eatnuts.com Chocolate Covered Nuts, Eatnuts.com Dried Fruits or even just Eatnuts.com Nuts and Eatnuts.com Seeds without the chocolate. You can also really simplify things by purchasing Eatnuts.com Ready-Made Mason Jars from us and include them in your Valentine day gift sets for her. Depending on the woman you are shopping for you can personalize the perfect Valentine's gift for her according to the flavors she loves. Create a coupon book for your Valentine and personalize it to make it the perfect Valentine's gift for her. Each coupon will represent some things that would be near and dear to her heart. Some coupon ideas are dinner - homemade or a night out on the town, a massage, bubble bath, breakfast in bed, or some other acts of service that you know she will love. Create coupon books for your beloved, your mother or daughter, or a friend. They will love it! Spending a little time to make your Valentine feel special and showing that you've really thought about your special someone means so much more than just spending a bunch of money on them. Spend some time and brainstorm on great Valentine's Day ideas for her. Consider things like her personal likes and dislikes, the context of your relationship, your budget, and the amount of time you both will have to spend together. If you are preparing Valentine’s Day gift sets for her, it is likely that you could include some gifts that are appropriate for each one of the special ladies in your life. The ideas mentioned above are neutral so that you can give them to any woman or man in your life on this day of love to make them feel special. As stated earlier, Eatnuts.com Chocolate, Eatnuts.com Nuts, Eatnuts.com Sweet Treats and Eatnuts.com Trail Mixes can be gifts for any man or woman, and will certainly be appreciated. Be sure to browse our website at Eatnuts.com while you're putting your Valentine's gifts together. In fact, be good to yourself! Add one more Valentine's Day Gift Set to the list just for you! Here at Eat Nuts we wish you a very happy Valentine's Day filled with much fun, love, and joy overflowing.